I’ve been keeping an eye in ATM security stories ever since reading about malware that targeted certain Diebold ATM systems. My curiosity is periodically reinforced by Brian Kreb’s series of posts about ATM skimmers. In that light, I found the following report of physical ATM break-ins interesting. According to a report by the Russian news agency Live News, Moscow police arrested a group of individuals accused of burglarizing ATMs during 17 incidents in Moscow, Russia, stealing a total of 45 million rubles in cash ($1.5 million USD). 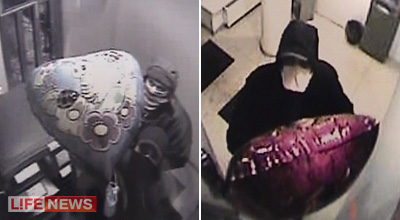 The gang allegedly used balloons to obstruct the view of the security cameras while cracking open ATM machines. Each burglary took, on the average, one minute to complete. According to Lenta.ru, the gang has been breaking into ATMs since 2005. Moscow Ministry of Internal Affairs reports that the team relied on its women members to watch out for police while the men cracked open the ATMs. The individuals ranged from 27 to 47 in age. According to another report, their getaway vehicles of choice were Mercedes S-Class sedans. As information security professionals, we sometimes forget how effective breaches to physical security can be. Check out my other posts, focusing mostly on information security.